Notes: Glenrose is a small distillery even by micro distillery standards – they only had a 4 plater 30 gallon multipurpose still from Artisan Distilling. They just recently added a 100 gallon Bain-Marie multipurpose from StillDragon and a small home brew experimental rig. Taste: Thick, sensuous entry, oily and full ( again in sharp contrast to some bone dry and thin gins)with a touch of almost Old Tom sweetness followed by a spicy drying and tingling with a crisp apple eau de vie backbone. Finishes with a lingering elderflower and juniper oily spiciness with a long pleasant fade to it. Bottle: Clear glass bell shape, . Heavier decanter type bottom lends an attractive appearance and adds a nice sense of heft to the bottle. Large Snow blue/gray paper label with better abrasion and spill resistance so bottle stays looking nice. 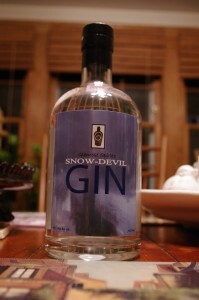 The main graphic of their logo ( a snow devil or very mini snow tornado/vortex similar to a dust devil) and their bottle graph to make a distinctive label that can be spotted at a distance. Label is easy to identify and read, also attractive and catches the eye. Stand out on a bar or store shelf. Closure is a natural cork topped by a disk of finished wood and a clear plastic neck capsule. Other: I love their (back) label statement “Produced in painfully small batches” Actually that translates in 3 gallon runs or one case of 12 750 ML bottles – that IS painfully small, handmade, production. Glenrose also produces an aged Applejack or Apple Brandy, 2 Pear Brandies, Batch 1 and Batch 2, an unaged whiskey , and several editions/releases of their Old Saloon Four Grain Malt Whiskey ( we reviewed Barrel/Batch 1, 11, and 14 ) along with a truly outstanding Absinthe made in the Pontarlier Style. Check their Facebook or website pages for updates. Final Thoughts: Thoughtfully and carefully made in a REAL handcrafted, hands on way, this gin not only bursts with flavor, but originality and sincerity .